Bracelet, glass, copper bronze, 38mm wide, 6-1/2 to 7 inches with button clasp. Sold individually. Item Number: H20-6488JD Have a question about this item? 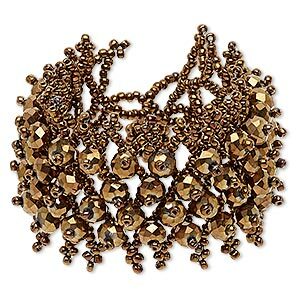 Ready-to-wear bracelet has a pattern of glass seed beads mounted with faceted rounds, all colored in copper bronze. Finished with a button clasp, the bracelet fits wrists up to inches. Colors, shapes and sizes may vary in each lot. 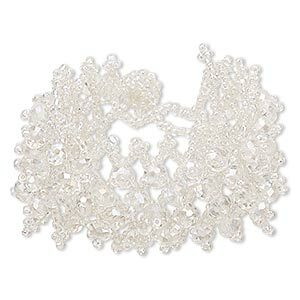 Bracelet, glass, clear AB, 38mm wide with faceted round, 7-1/2 inches with button clasp. Sold individually. 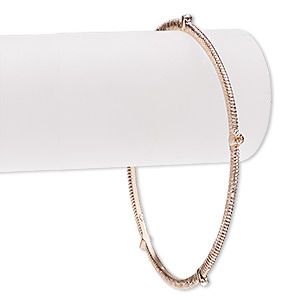 Bracelet, bangle, glass rhinestone and copper-finished brass, clear, 3mm wide with corrugated design, 7-1/2 inches. Sold individually. 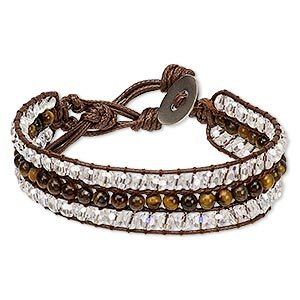 Bracelet, tigereye (natural) / waxed cotton cord / glass / stainless steel, clear AB and brown, 18mm wide, adjustable from 6-8 inches with button clasp. Sold individually. 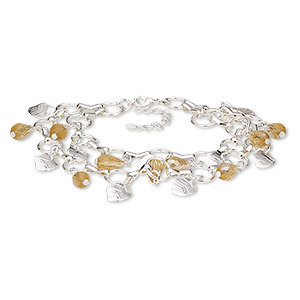 Bracelet, 2-strand, glass and silver-plated steel, topaz yellow AB, 25mm wide, 7-1/2 inches with 2-inch extender chain and lobster claw clasp. Sold individually. 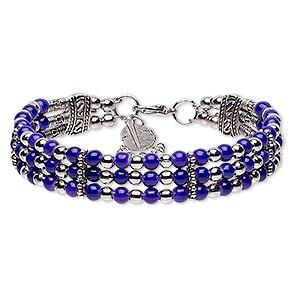 Bracelet, 3-strand, glass / silver- / antique silver-plated steel / "pewter" (zinc-based alloy), purple, 13mm wide with 24x8mm feather dangle, 7-1/2 inches with 2-inch extender chain and lobster claw clasp. Sold individually. 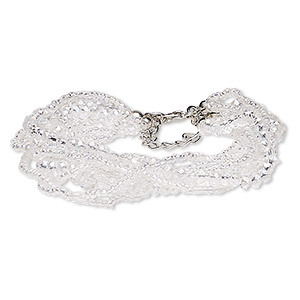 Bracelet, 9-strand, glass and silver-finished steel, clear AB, 18mm wide, 7 inches with 2-inch extender chain and lobster claw clasp. Sold individually. Bracelet, 9-strand, glass and silver-plated steel, multicolored, 19mm wide, 7 inches with 2-inch extender chain and lobster claw clasp. Sold individually. 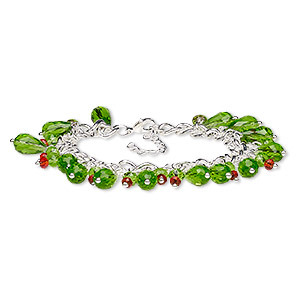 Bracelet, glass with silver-finished steel and "pewter" (zinc-based alloy), green and red, 27mm wide, 7 inches with 2-inch extender chain and lobster claw clasp. Sold individually. Bracelet, glass with silver-plated steel and "pewter" (zinc-based alloy), black, 18mm wide with 1-3/4 inch drape, 7 inches with 1-3/4 inch extender chain and lobster claw clasp. Sold individually. 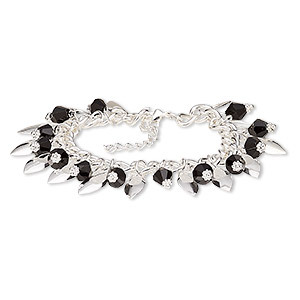 Bracelet, glass with silver-plated steel and "pewter" (zinc-based alloy), black, 24mm wide, 7 inches with 1-3/4 inch extender chain and lobster claw clasp. Sold individually.